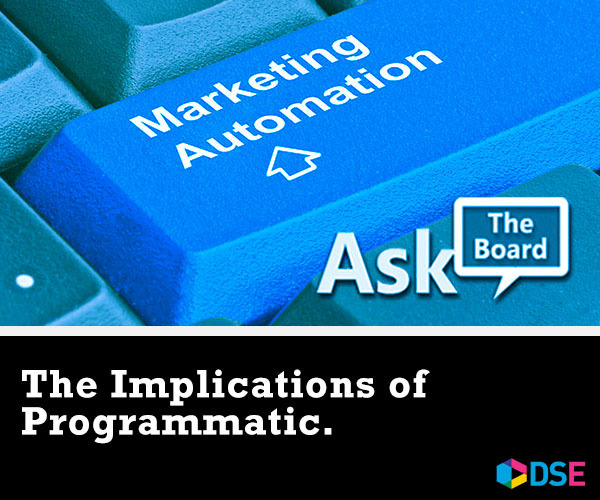 How do you define programmatic and what are its implications for buying and selling digital signage ads? Programmatic is an automated method for serving ads. It is an exciting new tool that allows for micro-targeting within the physical world. Advertisers will now be able to reach a desired target market across a large digital signage network. This makes DOOH advertising much more valuable and attractive; however, its success will always hinge on the accuracy of data and demographic research. The tools a company uses to mine for data and how often that data is refreshed will play a major role in the continued growth of buyers. As the technology expands, so will the tool sets put in place to aid data accuracy. For brands that have their own digital signage network, there are similar tools currently available that will allow for micro-targeting. At ClockNine, we use Smart Content™ to help clients deliver the right message at the right time. Smart Content™ programmatically makes decisions for you based on data that is infused into the content and UI. Weather, time of day, POS data trends, and even demographic tagging can all be done to alter an ad and deliver the message that is most appropriate. These industry advancements open many new doors for advertisers by strengthening their confidence in digital signage. The ability to use micro-targeting within digital signage is something the industry has been craving since its conception. Using tools like this will eliminate errors and inefficiencies of a manual workflow by minimizing human error. When digital signage first began, it was all about the ability to quickly change your content manually. In 2018, we are entering the new and exciting era of digital automation.